Brandon87 wrote: And for the sauce vs no sauce discussion... I noticed when judging that over half the judges would take their piece from the breast without any skin at all. I don't think sauce plays as huge a factor as most cooks think. 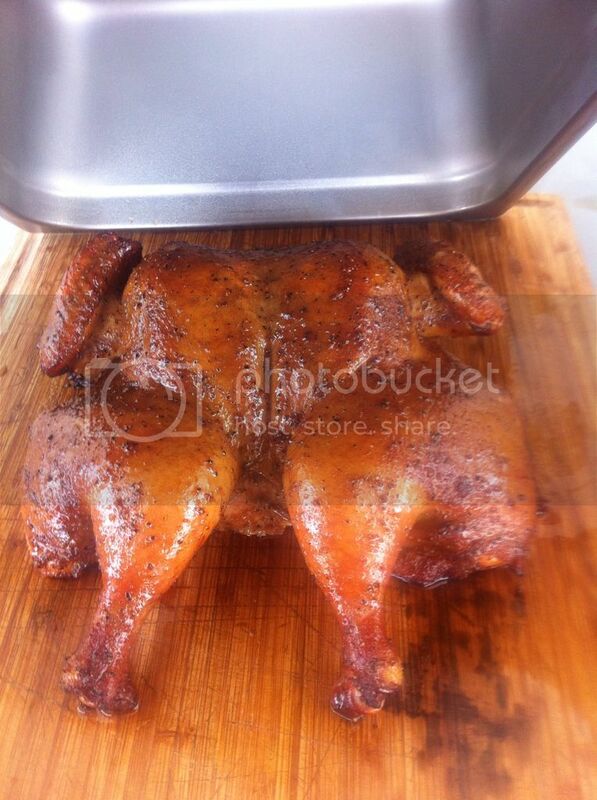 A moist and tender breast with just the right amount of seasoning from the brine / injection will win competitions IMO. Brine or inject? What temp are you cooking your birds at? Smoking or grilling? I brine, but have been playing around with injections. Brining has worked great for me as far as getting flavor to the bone on chicken, but I suffer with the moisture in the breast. I have stayed away from injecting because brining is so dang easy, open the ziplock, pour in the brine, shake it around then back in the cooler...don't get any easier. I smoke my birds at 275 or so. I brine my chicken and the juice just rolls out when cutting into it! I never probe the breast and pull it off when it hits 165 between the leg and thigh. You poke the breast and lose the $$$ juice!! Any questions thoughts, tips on setting up your turn in box for the Houston Livestock Show/Rodeo cook-off? 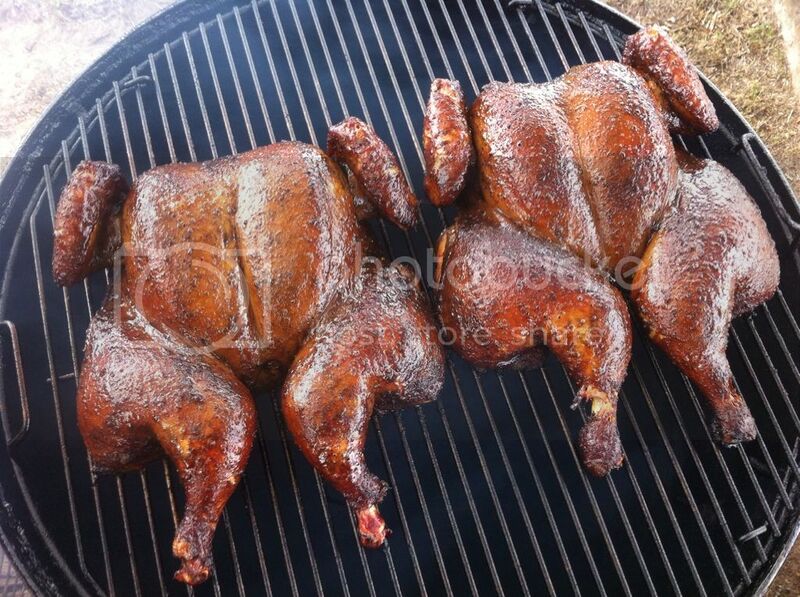 I brine as well... usually cook chicken on the egg @ 325 using apple chunks for smoke. If by chance I only take one pit to cook everything it's @ 275. I can second the comment that it is full of juice when it's done. So much so I've learned to make it a habit to carry a napkin with me to turn in cause it's inevitable I'll be asked to soak out juices that are in the box that have ran out. Guess if I'm going to have a problem thats one I'll take. As for the juice... Yes, we brine. And, yes, our chickens are squirters. Soak in brine over night, pat dry, air dry for additional hour, rub with your fav rub (no sugar) including rubbing under skin. I make a lil hole on the breast and the thigh thus creating a pocket to hold the rub. Put on pit at 350* for 1:15 pull and rest for 30 min, then throw on a castiron skillet or pizza stone that has been heated to 400-450* skin down for 5 min then flip for an additional 5. Btw, I use as close to a 5lb bird as I can get. What are you glazing or saucing your birds with? I have been using Craig Sharrys' new sauce, but have been playing with a few other concoctions during the winter for grins and giggles. Craigs' sauce needs no thinning down, but the typical off the shelf variety needs some thinning with melted butter and / or apple juice to avoid clumping and get a nice smooth finish, of course as has been mentioned numerous times, appearance means little in Texas BBQ, but I still want my food to not only taste amazing but look amazing as well. When heating your sauce, don't let it start bubbling, keep a wisk on it or just keep your sauce pot in your pit or warmer to keep it just right without boiling for glazing. I glaze mine with my own personal mix... 2 commerical sauces, butter and brown sugar or honey. We brine inject, then marinate in a homemade concoction with BBQ rub and ..... and cook birds with big ol Pamela Anderson breastisiz between 4.9-5 lbs. In IBCA we glaze lightly with a commercial BBQ sauce that's hard to find and we thin it down with some organic pineapple juice. In CTBA and local cookoffs we go with a semi sweet savory spritz. Is it just the higher cooking temps that get those beautiful colors on those chickens, or is there a secret? like butter or olive oil?!?! Darn pretty birds for sure there J$.